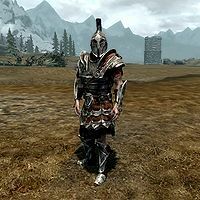 This page lists all unused NPCs in Skyrim. None of these NPCs are present in the game; only those in test cells can be encountered without spawning them via console codes. Their descriptions on this page treat them as they would be if they were implemented in the game. Some of the locations, quests, and buildings mentioned in their descriptions do not exist either, yet are treated on this page as if they do. 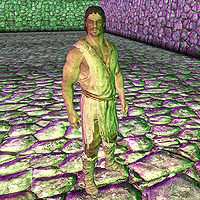 The Affable Gent is a Nord warrior who exists in test cell WarehouseAmbushes. He sleeps when there is nobody around, and will ambush the player. 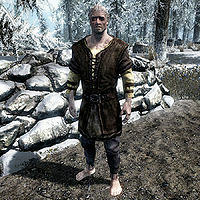 He wears noble clothes and fur-lined boots, and carries a honed ancient Nord battle axe. His voice type is MaleNord. 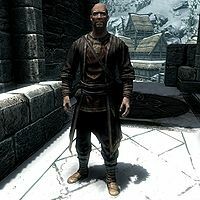 Argi Farseer is a Nord mystic. She is Idgrod Ravencrone's sister, as indicated by a relationship marker. Argi wears a set of farm clothes along with a pair of boots. She carries an iron dagger and a key to her hut located in Stonehills. Her voice type is FemaleOldKindly. She sleeps at 11pm, waking up at 10am. There is under a 20% chance that she will interrupt her sleep at 3am for a three-hour stroll around Stonehills. She spends the rest of her time in her house. This article is about the unused NPC from the base game. 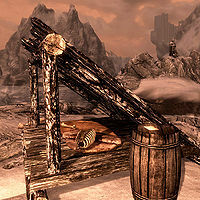 For the NPC added by Dragonborn, see Benkum. 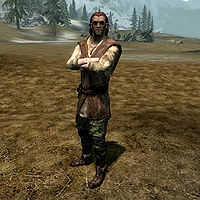 Benkum is a Nord warrior who manages Windhelm's arena. He is Angrenor's friend and Huki's boss. His schedule keeps him in the Bloodworks all the time, never sleeping or moving from his spot. He wears scaled armor and scaled boots, and carries an iron dagger. His voice type is MaleSlyCynical. "Hello, hello, hello. Interested in fighting in the Pit? The rules are strict, but if I don't see it, it didn't happen, know what I mean?" "It's very important to Huki that all the battles are fair. What's more important to me is that my pay is fair." "Prove your valor in the Pit! If you haven't got any valor, prove your pocketbook!" 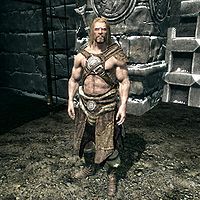 Brond is a Nord warrior used in Windhelm's arena. He wears hide armor and hide boots, and carries a dragonplate shield, steel greatsword, Imperial bow, and 30 iron arrows. He is Huki's friend, Edorfin's rival, and Liesl's foe. He sleeps for seven hours starting at 10pm, and spends the rest of his time in the Bloodworks. His voice type is MaleDrunk. "I've been a lot of things in my life. Pit fighter's the one I'm best at." "We should get a dragon for the Pit. I'd love to fight one." "I've been fighting in the Pit for years. That should tell you something." "There's two kinds of Pit fighters -- good ones and dead ones." 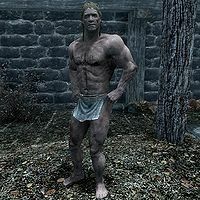 "Ulfric once tried to get me to fight for him, but marching bores me." "Steel. Barehanded. Armor. Naked. It's all fighting. I can kill you with a weapon or by myself. No difference." 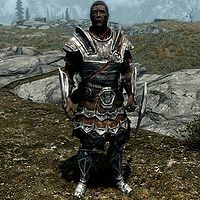 Captain Metilius is a Nord Imperial Soldier. He wears an Imperial soldier outfit without a helmet, and carries an Imperial bow, 10 steel arrows, and a steel greatsword. If both Bleak Falls Barrow and The Jagged Crown (either faction) are in the player's quest log, he stands near the war room in Castle Dour. He sleeps for eight hours at midnight, and wanders around Castle Dour from 8am to 8pm. The rest of the time he wanders near or around the castle. His voice type is MaleCommander. 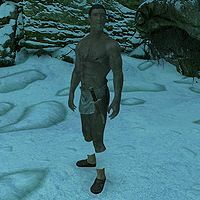 Castor the Puzzlemaker's Corpse is a Dunmer bandit added by Dragonborn who would appear in Damphall Mine along with a dead Bandit Highwayman. He wears leveled bandit boots and cuirass, and carries a steel dagger, some random loot, and sometimes a small amount of gold. If alive, he would know fast healing, magicka recovery, stoneflesh, a ward spell, and either a fire, ice, or lightning spell. 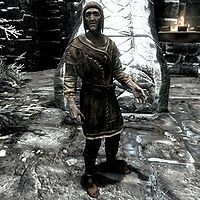 The College Guard is a Nord sorcerer. He wears a set of master robes of Destruction along with a pair of boots. His voice type is MaleNordCommander and he uses guard dialogue. Cow Hand is a Nord warrior. He and a painted cow are used in the unimplemented quest CWMission08, which involves Giants and the Civil War. He wears a set of farm clothes along with a hat and a pair of boots. His voice type is MaleOldKindly. Dawnguard Hunter is a Nord bandit. 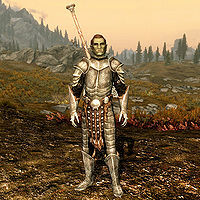 He wears a set of Dawnguard heavy armor with matching gauntlets and boots. DomnaMagia is an Imperial warrior in the middle of Solitude. She wears necromancer boots and leveled vampire attire. Her voice type is FemaleCoward. 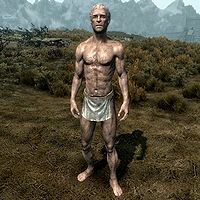 Do Not Delete Me - needed for export to work is a naked Nord added by Dragonborn who is not located anywhere. The Drunk Cultist is a Breton mystic who was to be used in the quest A Night To Remember, but her ref is never activated. She stands in Morvunskar at the base of the steps before the portal to Sanguine's realm. She sleeps for eight hours at midnight, wandering around Morvunskar the rest of the time. She wears warlock boots and leveled warlock robes. Her voice type is FemaleSultry. 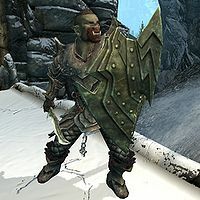 Edorfin is a Bosmer warrior used in Windhelm's arena. He wears studded armor and hide boots, and carries a steel sword, hunting bow, and 200 steel arrows. He is rivals with both Brond and Liesl. He sleeps for 8 hours a day starting at noon, and the rest of the time he attacks a ranged target. His voice type is MaleElfHaughty. "What I lack in strength, I make up for with tenacity." 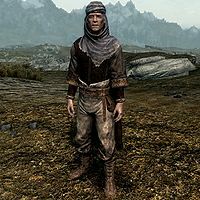 This Enthralled Wizard is a Nord bandit wizard. He wears black mage robes and warlock boots. He carries an iron dagger, and may drop a scroll and potions when killed. Note: Two separate enthralled wizards are actually encountered in the game, during The Staff of Magnus. Information on these two NPCs can be found on this page. 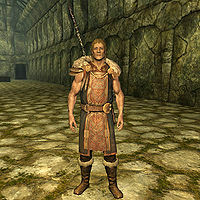 The Escaped Prisoner is a Nord warrior. He wears a roughspun tunic and footwraps. He was to be used in a world interaction. He has no inventory. 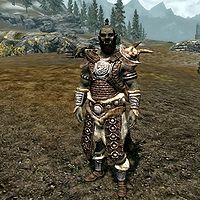 Fellow Prisoner is a bandit who fights in Windhelm's arena. He or she carries an iron sword, an iron shield, and a lockpick. Grushnag is an Orc warrior who travels with a caravan. He wanders around the caravan when stopped. 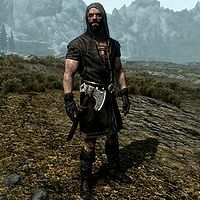 He wears scaled horn armor, scaled boots, and scaled bracers. His voice type is MaleOrc. This article is about the unused headsmen. 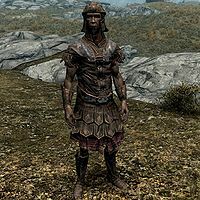 For the Headsman encountered in Helgen, see Headsman. 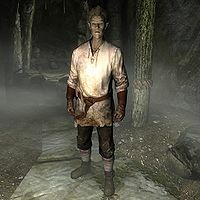 Two Nord Headsmen are used in the unimplemented quest WEDL11, a world interaction. They both wear executioner outfits and carry a headsman's axe. Their voice type is MaleBrute. Henrik is a Nord warrior who is a victim in The Wolf Queen Awakened. He wears a set of farm clothes along with a pair of boots. He has no voicetype assigned, and no inventory. 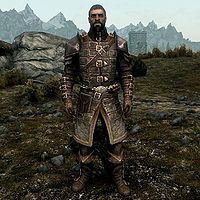 Herebane Sorenshield is a dead Imperial citizen. He wears an outfit of Imperial armor with a full-faced helmet and carries a leveled amount of gold. If alive, he patrols a small area around him, but does not converse with anyone. 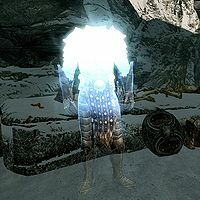 There are two items present in test cell QASmoke that are named after him: an elven shield named Herebane's Fortress that resists frost damage and an elven sword named Herebane's Courage that does fire damage. His voice type is MaleCondescending. 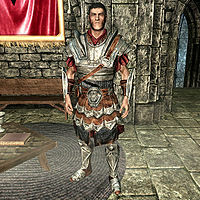 Hrolmir is a Nord warrior involved in the quest The Pursuit. His voice type is MaleBandit. He has no clothes or inventory. 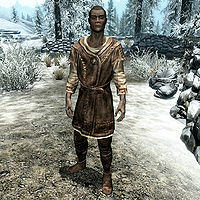 Huki Seven-Swords is a Nord warrior who works as jailkeeper in Windhelm's arena. She is Brond and Brunwulf's friend, and Benkum is her boss. She stands in the Bloodworks all day. She wears studded armor and hide boots, and carries an iron greatsword. Her voice type is FemaleNord. "Real Nords like to prove their mettle in the pit." "Just between you and me, I wouldn't mind if the Empire just up and left for good." "I'd love get one of those Imperial weasels under my boot..."
"All right, meat, it's time for you to earn your freedom." Huki: "What is this, you think you're clever? If you want to fight your way out of here, you have to do it in the Pit. Gotta give the crowd a show. Luckily there's no shortage of Pit bait around here. Now get in there and earn your freedom." Player: "What do I have to do?" Huki: "We don't just let people rot in cells until they've served their time. Here, you fight. If you win, you go free. If you lose, well, you'll know the freedom of Sovngarde if you're lucky." Player: "I'm ready to go." Huki: "All right. Head to the pit when you think you're ready." Huki: "Well aren't you in luck. He's the next piece of gutter scum on the docket. Between you and me, I hope you cleave his arrogant head open." The Imperial Officer is an Imperial soldier. He wears an Imperial soldier outfit without a helm, and carries an Imperial light shield, Imperial sword, and steel dagger. He was intended to be used for Civil War sieges. He patrols the area around him. His voice type is MaleSoldier. The Imperial Wizard is an Imperial mage. He wears an Imperial guard outfit (light armor), and carries a leveled warlock dagger. Possible spells include Firebolt, Healing, Flames, Oakflesh, and Lesser Ward, with the perks Regeneration and Augmented Flames. He was intended to be used for Civil War sieges. His voice type is MaleSoldier. The Insane College Wizard is an Altmer mage used in the unimplemented quest Rogue Wizard. 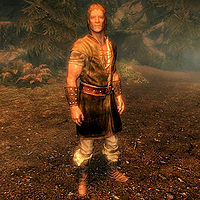 He has been wandering a hold of Skyrim, irritating the local Jarl, and the College of Winterhold has severed all ties with him but must save their reputation by killing him. He wears expert robes of Destruction with a pair of boots. His voice type is MaleCoward. This article is about the citizen Jolf. For the ferryman added by Dawnguard, see Jolf. Jolf is a Nord citizen. 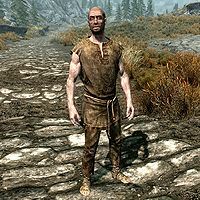 He wears a leveled farmer's tunic. His voice type is MaleBrute. This article is about the unused NPC in the base game. 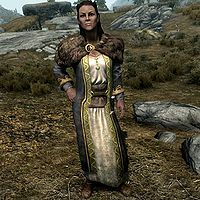 For the NPC added by Dragonborn, see Liesl. 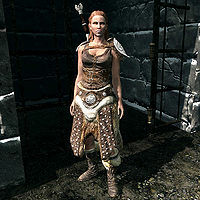 Liesl is a Nord warrior who fights in Windhelm's arena. She is Edorfin's rival and Brond's foe. She sleeps at midnight for seven hours, and then wanders around the Bloodworks for the rest of the time. 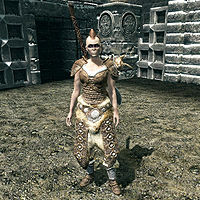 She wears scaled horn armor and scaled boots, and carries an iron shield and iron battleaxe. Her voice type is FemaleCommoner. "Stand away from me, or I'll crack you like an egg." "What are you looking at? Scared of strong women?" "You look mighty tasty. Better not stick around for supper." 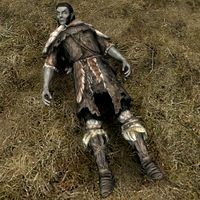 Load Dummy is a vampire lord added by the Dawnguard add-on. He wears an unplayable set of vampire royal armor. His voice type is DLC1MaleUniqueHarkon. Load Dummy appears to be used for Lord Harkon's vampire lord form during Kindred Judgement. Makhel Abbas is an Orc bandit used in the nonexistent Civil War quest CWMission11. He hunts animals while the quest is active. He wears leveled bandit armor, with a 50% chance of having gauntlets or a helmet, and carries a leveled dagger, two-handed weapon, and gold. His voice type is MaleOrc. 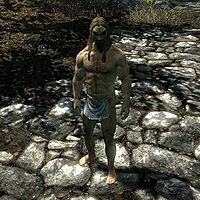 Marauders are Orc bandits used in the E3 demo of Skyrim in the location Bleak Falls Tower. This marauder wears Orcish armor, boots, and gauntlets, and carries an Orcish sword and shield, along with leveled gold and a leveled two-handed weapon. He has multiple perks fitting his class. His voice type is MaleOrc. 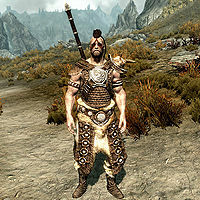 The marauder archer wears ancient Nord armor, boots, and gauntlets, and he carries an Orcish bow with 11 Orcish arrows, along with two steel daggers and leveled gold, with a 25% chance to carry a lockpick. He has a few Archery perks. His voice type is FemaleOrc. 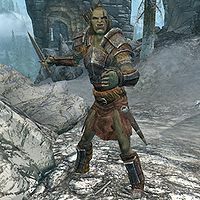 Mazgak is an Orc bandit involved in the quest Ill Met By Moonlight as a hunter. She wears hide armor and hide boots, and carries a long bow, leveled gold, a leveled poison of Damage Stamina, and a leveled sword, with a 75% chance of carrying 10 iron arrows. Her voice type is FemaleOrc. 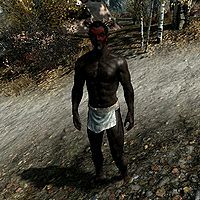 Mithorpa Nasyal is a Dunmer farmer at Barleydark Farm, a location near Sleeping Tree Camp that also does not appear in the game. He is the only one in his faction. His voicetype is MaleCoward. He wears a set of farm clothes along with a pair of boots. He carries his house key and an iron dagger. 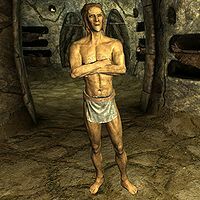 When interacted with, he will at first say, "Come to gawk at the Dark Elf?" and then apologize, "I mean no offense. I am but a humble farmer. Not a... a great wanderer, like you." 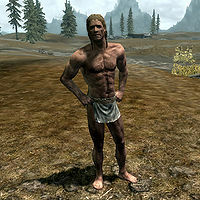 If you are a Dunmer, he may also be found saying, "Well look at us. Like two gray specks in the snow." 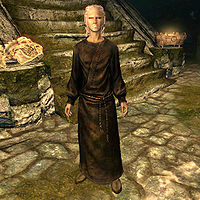 Muril is an Altmer elemental mage. 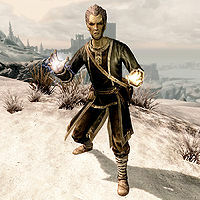 Along with Ancano and his underling Estormo, Muril is part of a Thalmor infiltration unit attempting to undermine the College of Winterhold. He follows Estormo during The Staff of Magnus. Noble is an Imperial citizen who was to be involved in the same encounter as the male Noble. She wears fine clothes and fine boots, and carries a leveled dagger. Her voice type is FemaleCondescending. 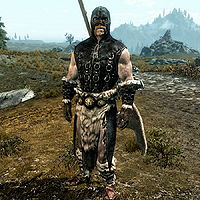 This Nord warrior was to be used in a random encounter, or was to be a template for NPCs used in such an encounter. He wears leveled light armor and boots, and carries a number of leveled items, including food and a weapon. His voice type is MaleNord. 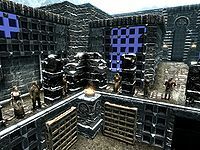 Pit Fans are used in Windhelm's arena. They exist in cell WindhelmPitEntrance. They ignore all combat. They are intended to cheer, but they merely travel short distances. They wear boots and clothes, with the outfits varying between fans. They have no voices. Player Friend is an unlucky Nord warrior used in the quest With Friends Like These.... He is friendly with the player. He wanders around Candlehearth Hall, acting as a normal NPC would. He wears and carries nothing. His voice type is MaleNord. His name hints at the original direction of the related quest. 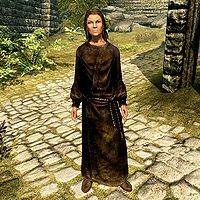 Pre-release reports for Skyrim claimed that the Dark Brotherhood would make you assassinate NPCs whom your character had befriended, although this obviously didn't make it into the final game. 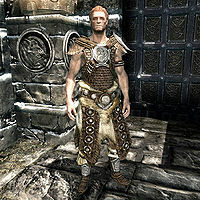 Reves is a Nord warrior used in the quest The Pursuit. He wears and carries nothing. His voice type is MaleBrute. 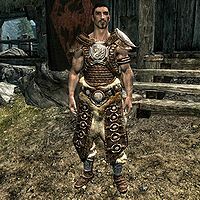 Rogen is a Nord warrior added by the Dawnguard add-on. He wears a set of vampire robes with matching hood, gloves, and boots. In combat, he relies on an iron war axe. His voice type is MaleCommonerAccented. 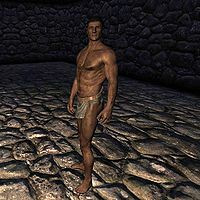 There are six Saarthal Miners, three of which are Bosmer and three of which are Dunmer. 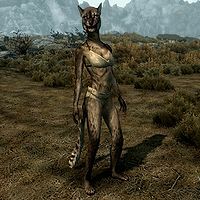 The Bosmer have the MaleCoward voice type, while the Dunmer have the MaleDarkElf voice type. Each of them carries a pickaxe. They all wear miner's clothes with a pair of boots, and two of them also wear a pair of gloves. They are present in Saarthal. "I'm just doing what I'm told." "Gods, it's cold. They'd better find something good in there to make this worthwhile." "As long as the College keeps paying, I'll keep digging." "For thousand-year old ruins, they're not much to look at." "Can't imagine what the College expects to find in here." 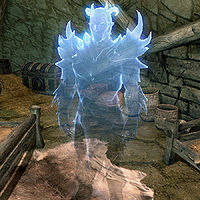 Spirit of the Ancient Traveler is a Nord bandit ghost in Wayward Pass. He wears Steel Plate Armor, Steel Plate Boots, and Steel Plate Gauntlets—versions that the player cannot wear—and carries a steel sword. His voice type is CrAtronachFrostVoice. 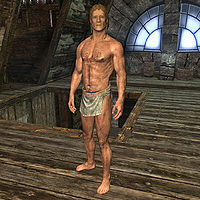 Steirod is a Nord lumberjack who lives together with his brother Trilf at Irontree Mill. He wears some farm clothes along with a pair of boots. He carries a key to the Irontree Mill and wields an iron dagger. His voice type is MaleSlyCynical. Much unlike his brother Trilf, he will not want anything to do with you and will quickly turn you away: "We got everything in hand here. You aren't needed 'round here." He will be a little nicer if you continue conversation, giving a simple description of what he and Trilif do for a living: "We chop trees, we mill the wood. What more would you want to know?" He will then elaborate on this: "It's a hard way to make a living, but we find ways to make ends meet." He will then shift back to the same attitude he started the conversation with: "We don't take kindly to people snooping around our business." If his cold comments have not driven you away yet, he will state one last comment that might scare you away: "These axes can chop a lot more than wood, you know." 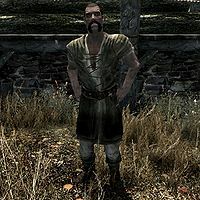 Sulvar the Steady is an elderly mystic who watches the wheel in Windhelm. He wears a belted tunic, some boots, and a hat. He also carries an iron dagger. He sleeps at noon for four hours and at 2am for four hours. He spends the rest of his time in the Wheelhouse. His voice type is MaleOldGrumpy. "My job? Well, I'm the Watcher of the Wheel! Which is... exactly what it sounds like. I watch the Wheel." "Watching the wheel isn't as simple as you might think. Have to inspect all the way around the ice, make sure it's not melting." "Don't get too many folks up here these days. Sometimes I think they've forgotten about me." Talib is a Redguard mage living in Stonehills. He is rivals with Jesper. Gestur Rockbreaker is his father. He sleeps for eight hours at noon, then wanders around outside for two hours starting at 9pm. He works in the mine from 8am to 6pm, then visits Argi until 9pm. From 11pm to 8am he can be found inside his house. He wears a belted tunic, some boots. He also carries an iron dagger. Despite being a mage, he knows no spells. His voice type is MaleYoungEager. Gestur: "How goes it, son?" Talib: "I'm fine, father. Work is fine." Gestur: "Good, good. It's honest work, son. No shame in that." Talib: "Of course not. I never thought otherwise." Gestur: "Right. Well, you let me know if you need anything." Tasius Tragus is an Imperial soldier living in Dragon Bridge. He works for General Tullius, and Varnius Junius works for him. Faida is his girlfriend and Julienne Lylvieve is his other lover. He sleeps for eight hours at midnight and spends the rest of his time wandering around a small area. His voice type is MaleCommander. He wears scaled armor and scaled boots, and carries an iron dagger. 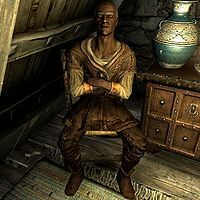 Terek is an Imperial citizen who illegally lives in Breezehome. He sleeps for eight hours at midnight. He wears farmer clothes and carries an iron dagger. His voice type is MaleDrunk. "Don't let the door slam into your backside on the way out." "Now if ya don't mind, my house could do with a bit of dusting." "You're in my home. That's right. This here place, Breezehome, it belongs to old Terek." "Oho! And what do you want, hmm?" "You can't kick me out of here. You want me gone, you're gonna have to kill me." "Now I don't care about no deeds, or laws, or other nonsense like that. This house was empty, so I settled in. And now it's mine." "I'm a generous man, to those who treat me right. Might be I'll even let you live here with me, if you mind your manners." TestJeffBCarryWaterBucket is a Nord warrior. He wears default Redguard clothing when awake and a Psijic Monk outfit when sleeping, but never sleeps. He also carries iron armor and gauntlets, and knows the Phantom Form shout. He does not exist in any cell and does not say anything special. He does, however, use CarryActorScript, and was probably used to test how NPCs carry items. 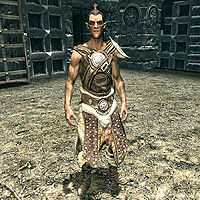 Thaer is a Bosmer warrior and carriage driver added by the Dawnguard add-on. He wears farm clothes and a pair of boots, and carries an iron war axe. His voicetype is MaleCommonerAccented and he shares his dialogue with other carriage drivers. He might have been planned as replacement for the Nord Thaer. 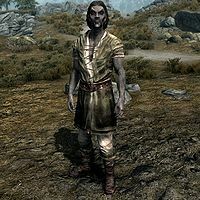 Thjollod is a Nord bandit who is involved as a hunter in Ill Met By Moonlight. He patrols Bloated Man's Grotto and follows the player in between stages 75 and 80 of the related quest. He wears iron armor, hide boots, and hide bracers, and carries a leveled bandit sword, a leveled bandit bow, and leveled gold (plus 25 extra gold). His voice type is MaleNord. 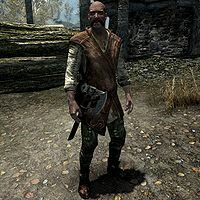 Trilf is a Nord lumberjack who lives together with his brother Steirod at Irontree Mill, located between the Thalmor Embassy and Ironback Hideout. He wears a set of farm clothes along with a pair of boots. He carries a key to the Irontree Mill and wields an iron war axe. His voice type is MaleYoungEager. Trilf greets you quite warmly when you arrive at the mill: "Hey, welcome to the mill!" He will then reveal to you that his brother and him are veterans: "My brother and me bought this place when we left the army. Boy, did we lose a bundle, but at least we're not fighting the war!" He will then elaborate on his days in the army: "We served our time in the Legion. Now we're just trying to make it day to day." He will continue on about the financial difficulties he and Steirod are facing: "We're making our money back, bit by bit. Every extra bit of work helps..."
Trius is a Breton bandit wizard. A note by him to someone named Shelly can be found at his camp near Pilgrim's Trench. He is involved in the unfinished quest Trius' Trinket, where you would have had to fetch a jewelry box for him in exchange for a new spell. Uglarz is an Orc warrior. 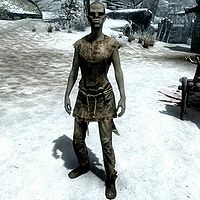 She wears ragged trousers with a pair of boots, and carries an Orcish bow and Orcish dagger, along with a selection of lower-class items and gold. Uglarz appears to have been intended to be the missing wife of Chief Mauhulakh in an unfinished quest called "NarzulburFreeFormWifeQuest" which also wasn't implemented in the game. At the start of the quest to find her, Chief Mauhulakh speaks of her: "I think of Uglarz. An old friend. When we were little she ran to the woods to hunt, and never came back. If someone found her, she would make an excellent mate." "I am Uglarz, huntress of all." "It was my home. But I left. The woods felt more alive, at least for a time." "Mauhulakh. I remember him. Little, scrawny, fellow." "Ha! Now that I would like to see. I may go back there some day." "Always thought that old mine had more to it. Just like Mauhulakh to smash his way to good fortune." "I'm going back to Narzulbur. Want to see how it's come." "You were right about this place. And about Mauhulakh." "This was worth coming back for." "Urog is a good learner. I'm glad I have the chance to teach her. Makes me not miss the woods as much." "Urog and I still hunt a lot, so it's not like I'm cooped up in the longhouse." When Uglarz is in Narzulbur, Urog will comment on her hunting skills, saying "Uglarz is a great huntress. Perhaps she can teach me something new." or "I never would have thought, but Uglarz is an even better hunter than Yatul was. 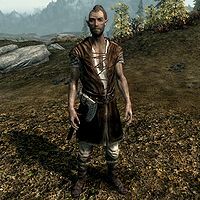 The things I'm learning now..."
The Urchin is a Nord warrior who exists in WICourierCell. He stays in a set location, never moving. He may have been meant for a Dark Brotherhood quest. He wears ragged robes along with ragged boots. His voice type is MaleEvenToned. 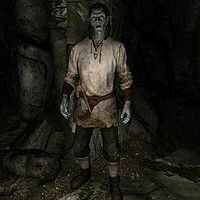 Viding is a Nord warrior who is involved as a hunter in Ill Met By Moonlight. He patrols Bloated Man's Grotto and follows the player in between stages 66 and 80 of the related quest. He wears farm clothes, hide boots, and hide bracers, and carries a leveled potion of Restore Magicka, leveled gold, and an iron dagger. His voice type is MaleNord. These NPCs can't be encountered directly and are used by the game for technical reasons. Azura resides in her voice cell and acts as a speaker during the quest The Black Star via a talking activator near the Shrine of Azura. Clavicus Vile is never instantiated. 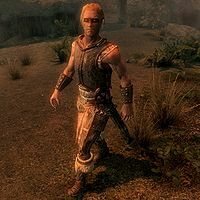 He is used as speaker for one line of dialogue and mentioned in three aliases for the quest A Daedra's Best Friend as "Additional Valid Voice Type For Export". Fish Hatchery is an NPC added by Hearthfire. His voicetype is MaleEvenToned and speaks generic dialogue. Hermaeus Mora is an orc added by Dragonborn. He has no voice. 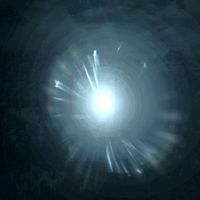 Various aspects of Hircine will be encountered as ghosts during Ill Met By Moonlight. He first appears in the quest after you kill a white stag. 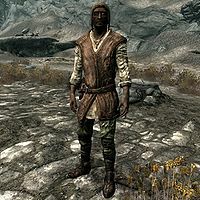 Hrothmund is a Nord placeholder NPC used for when his spirit speaks during Retaking Thirsk. His axe can be found lodged in an altar inside the barrow where he is buried. His voicetype is MaleNord. For more information on the historical person, see Hrothmund the Red. Malacath resides in Largashbur Longhouse and acts as a speaker during The Cursed Tribe. He can't be seen without console use, because he is forever disabled. His reference has an editor ID of ShagrolRef. Shagrol is the name of the previous leader of the Largashbur tribe and during the quest Shagrol's Warhammer needs to be recovered. 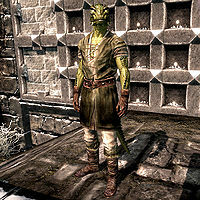 Mehrunes Dagon is a Daedric Prince who is encountered during the quest Pieces of the Past. As a reward for betraying Silus Vesuius at the Shrine of Mehrunes Dagon you will receive the daedric dagger Mehrunes' Razor. 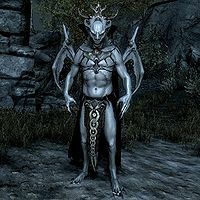 Mephala is a Daedric Prince who has a presence behind a locked door in Dragonsreach. 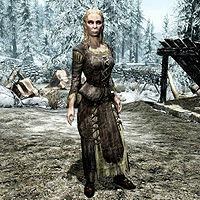 She is encountered during The Whispering Door, in which she tasks you with unsealing a locked room in Dragonsreach. As a reward for obeying her, you are gifted the Ebony Blade. Meridia is a Daedric prince. If the player happens to find Meridia's Beacon by accident or by asking at Meridia's Shrine, then the quest The Break of Dawn is activated. Meridia seeks for her Temple to be restored and sends the player to defeat Malkoran in Kilkreath Ruins. Molag Bal resides in the voice cell of Mehrunes Dagon and acts as a speaker during the quest The House of Horrors. Planter is an NPC added by Hearthfire. His voicetype is MaleEvenToned and speaks generic dialogue. Vaermina is the Daedric Prince of dreams and nightmares, from whose realm evil omens issue forth. She is known as "Vaernima the Gifter" and "Weaver of the Panoply". She is seen as one of the "demonic" Daedra, and some have also claimed her sphere ties somehow to torture. Vaermina's plane of Oblivion is Quagmire. It is described as a nightmare realm, where every few minutes reality shifts and becomes ever more horrifying. 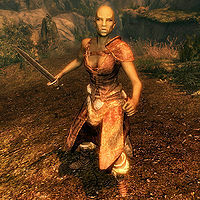 The Voice of Namira is a Bosmer Nightblade who exists in a cell to the east of the dining room in Reachcliff Cave. She can only be seen by using either the Aura Whisper shout or Detect Life spell. Although she can't be killed it is possible to hit her with the Chain Lightning spell if the player is pressed against the dining room's eastern wall, thus causing the player to be charged with an assault. 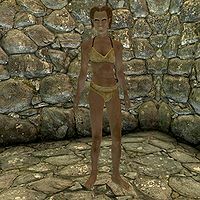 She wears no clothes, carries no items and cannot otherwise be interacted with. If you do manage to get to her cell you can attack her like other NPCs, but not kill her. Doing so will result in a bounty for The Reach. 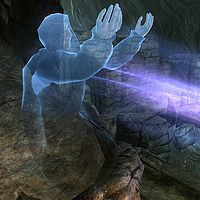 It is possible to reach her via using the Whirlwind Sprint exploit at the rightmost sarcophagus on the eastern wall of the dining hall in Reachcliff Cave. This page was last modified on 7 April 2019, at 18:11.